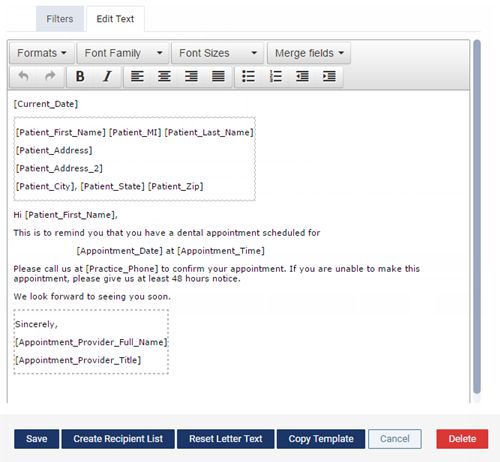 You can customize the content of a letter template that you can then merge with patient and practice information according to specified criteria (filters). On the Letters page, select a letter template. On the Edit Text tab, change the content and layout of the letter template, and format the text as needed. Also, you can insert a merge field (such as Patient First Name, Patient Address, Account Balance, and Appointment Time) at the location of the text cursor anywhere in the message. 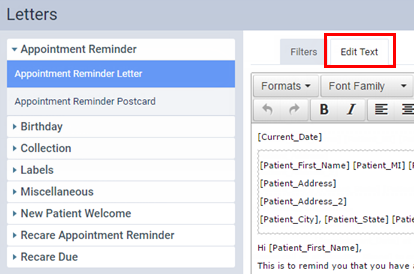 Note: A merge field appears in the template as text enclosed in square brackets (for example, [Patient_First_Name]), but the message that a patient sees will have the relevant information from your practice database inserted in place of the merge field (for example, [Practice Address] will be replaced with the practice address of a patient's preferred location).